Yngvild is a cave found on an island east-northeast of Dawnstar in the far northern reaches of Skyrim. The cave has two zones: Yngvild and Yngvild Throne Room. The four journals of Arondil the necromancer are found in this cave. These are required for a quest given by Vekel the Man in the Thieves Guild. Salty Sea-Dogs: Find some void salts for an inexperienced sea captain. 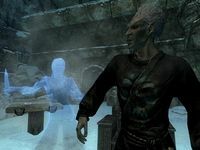 The cave contains several draugr and Yngvild ghosts, all females who are most likely the victims of Arondil's "experiments". Arondil's exploits are mentioned in his journals found throughout the cave. Going down the slope into the cave, find a burial urn behind a protruding rock on the right. The narrow tunnel opens into a cavern. Take the wooden ramps down to a table with a random potion on top. The passage onward heads east where a draugr will be patrolling. The passage then makes a slight curve to the left where a second draugr will be waiting. The passage opens out to a chamber with multiple tunnels. The tunnel on the left, heading north, leads to the first journal on a table. The journal is guarded by an Yngvild ghost. Dispatching this one will likely alert a second ghost and draugr in the next room. The room they come from is to the right and contains a stone table with two burial urns on top. A large urn and another burial urn are to the left of the table, and a final burial urn is wedged up against a corner of the empty sarcophagus to the left of the table. Backtrack to the main chamber. Standing in the mouth of the tunnel you just left, face southeast, and almost opposite you is another tunnel. This tunnel leads to a room with only two partly buried draugr to loot; one in front of the pillar to the right, and the other behind the pillar, tangled in some weeds. Backtrack to the main chamber again and turn right, heading east, to the final two tunnels. The tunnel heading north leads to a room with two burial urns and another ghost. The tunnel heading east leads to a large cavern with a broken bridge. This room is guarded by two draugr; one on the level with you and one on the level below. You can jump across the broken bridge to find two burial urns behind the pillar. Follow the curving path up to a ledge where an adept-locked chest is resting. Follow the path back down all the way to the ground floor where an unlocked chest is against the south wall. Follow the next passage northward to another table and the second journal. A woodcutter's axe and a scroll of Raise Zombie are also on the table. Another ghost and draugr await you further into the passage. Beyond them, in an illuminated alcove on the left, is the third journal and a random potion. The door ahead leads to the Yngvild Throne Room. The U-shaped passage leads right to the Yngvild Throne Room and Arondil holding court with a ghost in attendance. The four journals you collect imply that Arondil was not only a necromancer, but a necrophiliac. While fighting Arondil, he may remark, "Ah, another plaything for my collection," if you are female. To the right of Arondil's throne, a greater soul gem is on a pedestal. If the gem is picked up, the ghost next to Arondil will attack him. You must pick up the gem to incite the ghost. Simply knocking the gem off the pedestal only alerts the couple to your presence. Following this method, the easiest way to kill Arondil (provided you have a high enough rating in Sneak) is to sneak around the right of the room and come up behind the gem pedestal and steal it. This way the ghost will kill Arondil for you. Another ghost in the adjacent bedroom may join in this fray (if it lasts long enough). Either ghost seems more than a match for Arondil who, during the fight, will complain bitterly about the tables being turned. After the ghost(s) have taken care of Arondil, they will turn on you if you are detected. Find the key on Arondil's body and then have a look around. In the throne room there are three urns along the wall behind the throne, the pedestal with the filled greater soul gem on it, and a stone table with an empty petty soul gem, two bowls of ectoplasm and a copy of the Alteration skill book Reality & Other Falsehoods. The bedroom is through the iron door, behind the throne, to the left. A second ghost will be sleeping on the bed if she did not come out to handle Arondil. You can attempt to talk to the spirit, but this will only result in an immediate attack. Rather, a sneak attack is sufficient to dispose of her, or attempting to feed on the spirit as a Vampire will result in its destruction. An unusual gem, a bottle of alto wine, and a purple mountain flower in a tankard can be found on the desk with the last journal. There are several red mountain flowers scattered on the floor, as well as on and around the bed. A random potion is on a sideboard on the right as you enter. A Grand Staff of Charming is leaning against the boss chest. Back in the throne room, a passage to the east ends in a lever which opens a gate to the left. Here, the bodies of three women: a Nord, a Redguard, and a Breton, bear witness to Arondil's proclivities. At the south end of the room the master-locked door can be opened using Arondil's key. The door leads to a winding staircase back up to Yngvild. At the top of the stairs is a door that opens into a room with an apprentice-locked chest. Follow the narrow tunnel east to a lever. This opens a secret door into one of the rooms that you have visited previously (one of the small rooms off of the chamber with the multiple tunnels). Backtrack from here to the exit. 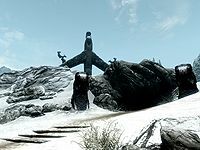 If you head south-southeast from the entrance to Yngvild onto the mainland you will come across the charred remains of Yisra, a student from the College of Winterhold that recently went missing. Among the burning remnants that surround her is a copy of a Spell Tome: Flame Cloak. On a small island west of the entrance to Yngvild is a gold ore vein; another is on the small island to the northeast of the entrance. This page was last modified on 30 January 2018, at 01:03.